Daylight saving time is the process of advancing our clocks one hour forward in Spring and back one hour in Autumn. 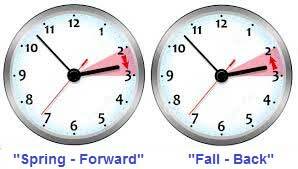 As the old saying goes "Spring forward" and "Fall back" helps us remember how to change our clocks. This is done to allow for more hours of daylight thus more overall productivity and some claim it saves energy by populations using less light but others disagree. As of recent there is debate on the overall benefits vs. the drawbacks of DST. Not all countries north and south of the equator participate with Daylight saving time(DST) but most do. In the Northern Hemisphere DST begins in the spring between March and April and ends in the fall/autumn between September and November. In the Southern Hemisphere DST begins in the spring between September and October and ends in the fall/autumn between March and April. George Vernon Hudson from New Zealand first proposed the idea of DST and Germany along with Austria-Hungary first implemented it in the year 1916. Leap Year - details on leap year. Gregorian Calendar - explains calendar system used for this site. Seasons - provides details about the 4 seasons.